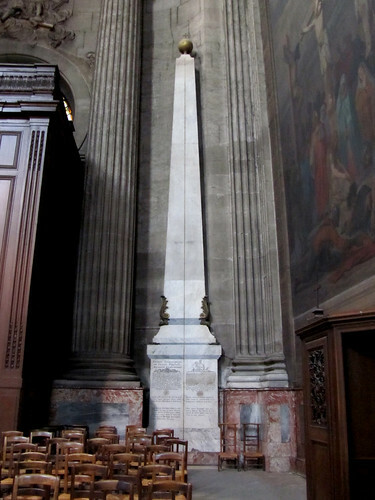 Not everyone’s pleased with Dan Brown’s writing and I guess one of them are the folks from St Sulpice, who may have to deal with the many queries that they put up this sign next to the gnomon inside the church, indeed built around a meridian but not the Paris Meridian. “Contrary to fanciful allegations in a recent best-selling novel, this is not a vestige of pagan temple. No such temple ever existed in this place. It was never called a < Rose-Line >. It does not coincide with the meridian traced through the middle of the Paris Observatory which serves as a reference for maps where longitudes are measured in degrees East or West of Paris. No mystical notion can be derived from this instrument of astronomy except to acknowledge that God the Creator is the master of time. There you go, a little random information for the day. ahaha! it’s amazing what over-febrile author minds can make up and gullible people will believe…..